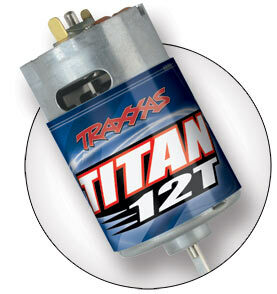 The Slash includes a powerful Titan 12T 550 modified motor with internal cooling fan. The Titan’s over-sized armature (30% larger compared to 540-sized armatures) is equipped with 12-turns of pure copper wire for big torque and increased power-handling capabilities. Lower running temperatures are achieved with the integrated cooling fan. The Titan 12T requires very little maintenance and is designed for consistent torque and high speeds from run to run, without fading. 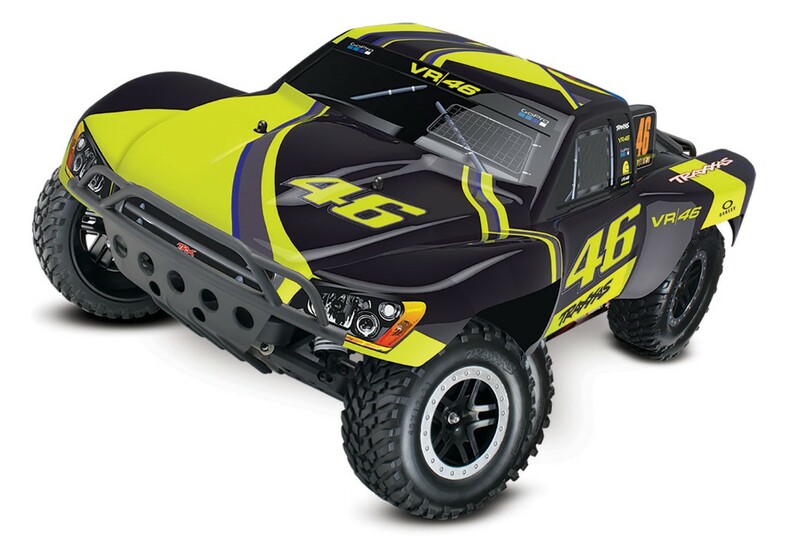 Slash includes a genuine iD-equipped Power Cell NiMH battery to make sure you experience all the performance that’s been engineered into your Traxxas model. Accessory Traxxas iD chargers (sold separately) auto-detect Traxxas iD Power Cell batteries and automatically set and optimize charge settings for unmatched charging safety and simplicity. Power Cell packs are optimized for free-flowing power and maximum punch with premium quality, low-resistance cells; flexible, silicone-jacketed 12-gauge wire; heavy-duty welded tabs; and Traxxas’ high-output, gold plated, patented, High-Current Connectors. Precision assembly with attractive, individually wrapped cells and clear overwrap complete the Traxxas Power Cell package. 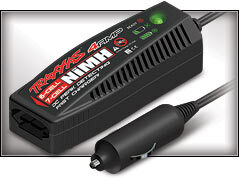 For even greater speed and runtime, a full line of optional Traxxas iD Power Cell NiMH and LiPo batteries are available. 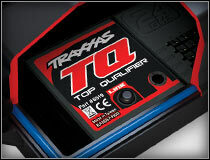 Power Cell batteries are Traxxas certified to maximize the performance and speed engineered into every Traxxas vehicle. The ESC, receiver, and steering servo are screwed to the chassis for ultimate mounting security. There’s no servo tape to loosen over time from dirt, heat, water, and collisions. 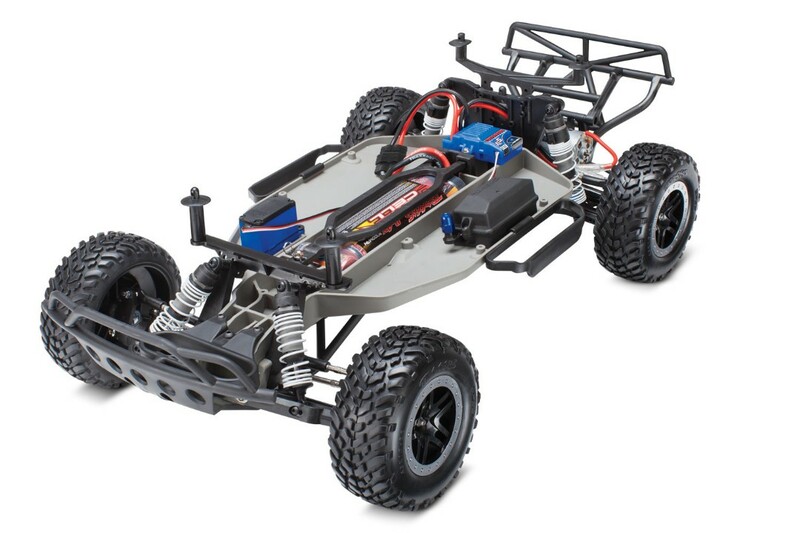 Designed from the ground up, the Slash chassis features a 13.2″ wheelbase while offering over 3.5-inches of ground clearance. The chassis includes drain holes and a battery tray channel for routing servo wires to the receiver. Optional electronic speed control mounting bosses are incorporated into the chassis, making it easy to upgrade to the Extreme Power of the Velineon Brushless Power System. For race track competition, a transponder mount is located under the front shock tower when every second counts. Realistic looks, realistic performance. Slash’s tires have excellent grip in the dirt and just the right amount of slide on pavement and are mounted and pre-glued on impressive 2.2″ wheels. Factory fitted, heavy-duty steel turnbuckles allow camber and toe tuning. 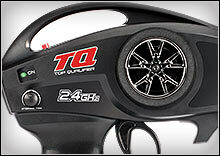 The Slash is completely adjustable right out of the box to fine tune handling agility and high-speed performance. Captured rod ends provide unmatched durability and they simply won’t pop off. The Slash’s Magnum 272 transmission is assembled with all metal gear internals riding on ultra-smooth sealed ball bearings. Combined with the smooth 48-pitch gears, power is delivered to the rear wheels via durable telescoping U-joint driveshafts for maximum efficiency and articulation. The bulletproof Torque-Control slipper clutch and metal gear Magnum transmission are ready to handle any power system upgrade including the Extreme Power of the Velineon Brushless Power System. The Slash’s oil-filled Ultra Shocks utilize X-ring technology for a perfect seal and super-smooth performance. They are fully tunable with a wide range of oils, springs, and pistons. Features include pressure bladders for air/oil separation and spring clips to precisely change the ride height and spring pre-load. They can be renewed in minutes with our inexpensive rebuild kits.